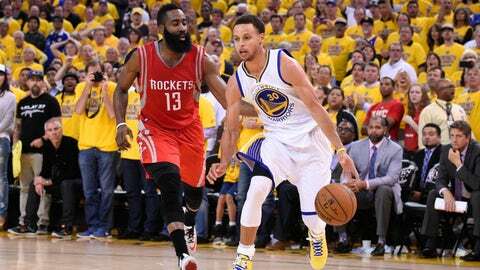 Stephen Curry won the head-to-head matchup with James Harden convincingly last season. The Houston Rockets are giving Stephen Curry and the Golden State Warriors bulletin-board motivation for the upcoming season. In an interview with NBA.com that came out Tuesday, Houston Rockets guard James Harden raised some eyebrows by saying he considers himself the "best player in the league" and "I thought I was last year, too." Harden continued, saying "I know I was the MVP. That’s 100 percent given all the things that happened last season." That, of course, is an indirect shot at Golden State Warriors star Stephen Curry, who won the 2014-15 MVP award last season. Not only did Curry nab 100 first-place MVP votes, compared to only 25 for Harden, but Curry’s Warriors defeated Harden’s Rockets in five games in the Western Conference finals. Harden may feel he has the advantage in the head-to-head, but the facts suggest otherwise. This is the second time Curry has had to address controversial comments from the Rockets backcourt in recent days. Last week, Rockets point Ty Lawson criticized Curry’s defense in the playoffs. Curry laughed off the comments, though one can only imagine the level of anticipation Curry has to face Houston and extract revenge next season.